Start with the dressing. Place the pomegranate juice in a small pan and boil down until reduced by two thirds. Cool, then add the remaining ingredients and whisk to combine. Set aside. 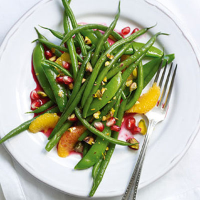 Place the beans, sugar snap peas and orange segments in a large serving bowl; gently toss to combine. Season to taste; drizzle with the reserved dressing and garnish with the pistachios and pomegranate seeds.